On first approaching the Bay of Naples my mind’s eye conjures up the sirens beckoning Ulysses and his sailors to their downfall against the rugged cliffs that hug the Sorrento Peninsula. This land of myths and legends has inspired poets, writers, musicians and actors for millennia and set against the terraces of lemon groves and vines I can see why. Being the most densely populated region in Italy it is not easily navigated, even today, so I’m part of a group with Travel Department, mixing guided tours with free days to explore at my leisure. Our guide Ugo Somma is a Sorrentine with twenty-two years experience guiding people like me around his home town − he has perfected the art of maximum coverage with minimal effort. He informs us that historically Neopolitans and those living in the environs were part of the cognoscenti during the golden age of the Roman Empire. 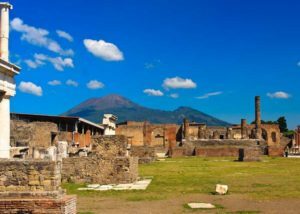 At it’s very pinnacle in 79AD the volcanic eruption of Mount Vesuvius destroyed much of the coast leaving the towns of Herculaneum and Pompeii in near perfect condition for the curious traveller to enjoy today. I start my explorations in Pompeii, once a thriving town of over 25,000 inhabitants it is now a remarkable museum spread over two square miles and permanent record of the moment their lives were drawn to a sudden halt. On excavation in 1785, the archaeologists poured plaster into the cavities of skeletal forms left in the petrified ash, leaving an eerie display of figures frozen in time as they tried to run or cover their faces from the intoxicating ash. The figures are on display at the ticket booth where I meander while Ugo takes care of entrance charges for the group. We enter the town through a passage of oleander flowers, under the gaze of Mount Vesuvius which has not erupted since 1944. Ugo passionately talks his way through the amphitheatre to the newly opened Venus House with spectacular frescoes of the goddess on a scallop shell. We view various solidified foods and perfectly preserved glass goblets. The frescoes on the walls explain what each building was used for, as we stroll along the cobbled streets. A favourite with visitors are the buildings north of what was the port in the town’s brothel. A pick and choose menu of explicit sexual positions meant sailors and locals didn’t need to share the prostitutes language. A full day could be spent exploring Pompeii but it is hot in July and Ugo has given out more information than my head can take in so we go for lunch in Lucullus, a restaurant recommended by him and for a set menu of €14 it offers good value and saves time choosing. Getting up early for the excursion means we return to the hotel to spend time at leisure. 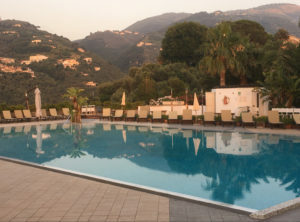 I’m based at the Moon Valley hotel in Seiano, a short four stop trip by train from the heart of Sorrento. Train tickets are cheap and can be got at reception. A day of rest between tours gives me a chance to explore Sorrento alone and enjoy the cafe life. Being a volcanic area the few beaches along this stretch are small with black volcanic sand. Dotted along the coast are Lidos with swimming areas but they do get busy at weekends and a parasol and two loungers will cost €28 for one day. 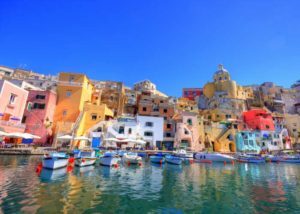 The town of Sorrento is perfect for getting lost and supporting the local economy by purchasing Limoncello sweets or liquors. Lemons are abundant and used to make soap, candles and a wide range of other products. A culinary speciality in Sorrento is lemon pasta which is surprisingly delicious. Good restaurants are easy to find in Sorrento on the side streets off the main square, Piazza Tasso. 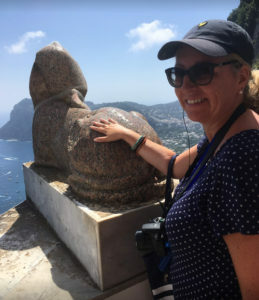 Day four is a full day excursion to Capri which takes thirty minutes to reach by Hydrofoil from Sorrento. Only ten square kilometres, Capri is split into two parts, Capri and Anacapri, and set on three levels. 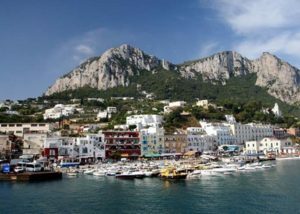 First occupied by the Greeks in the sixth century BC, Capri was named after the islands natural inhabitants, the wild boars. Since then it was much loved by icons Audrey Hepburn and Grace Kelly who left a fashionable stamp on the island which remains in the swanky shops and boutiques of designers such as Swarovski, Armani and Gucci. 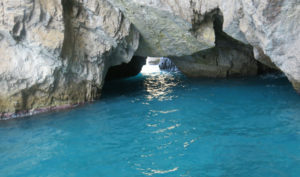 The Blue Grotto or Grotto Azzurra is the most visited site in Capri but excursions are very much weather dependent on the sea conditions and it is closed on the day I arrive. 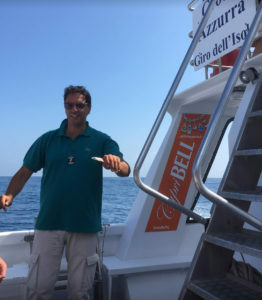 Ugo however comes to the rescue with a private boat tour for €14 which circumnavigates the island over one hour and brings us to several other accessible grottos. Ugo recommends Terrazza restaurant for lunch in Anacapri where we chat about myths and fables over a bottle of red wine labelled Lycrma Christi (tears of wine). According to legend the devil stole a piece of paradise, but when Christ went up to the top of Mount Vesuvius he looked down on the view and joyfully declared that he had found it again. The tears that flowed from his cheeks fell on the ground and from them the vines grew to provide grapes for Lycrma Christi. I awake on Sunday morning to a cacophony of cannon blasts and fireworks. It is the feast of the Madonna of Gratitude and an ideal day to rest from sightseeing. After morning mass the local churches are bustling with anticipation of more to follow in the evening time − this festival runs for several days as do most catholic festivals in Italy. Wide-eyed altar boys wait for the off to bear crosses and incense in a parade that is followed by the locals dressed in their Sunday finery. Mitred bishops and priests lead the advancing crowd as the 9th century statue of the Madonna delle Grazie is carried through the streets. 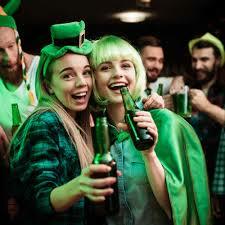 It’s a prelude to the following day of celebration including dancing, feasting on pizza and drinking the local wine. I enjoy merging with locals and watch the female police officer on a Vespa doing her job with aplomb. Italian style and fashion is unique and she looks like she has stepped out of the pages of Vogue to stop the traffic. The Amalfi coastline is regarded as one of the most beautiful drives in the world. However, the 60km long serpentine road from Sorrento to Salerno is best enjoyed as a passenger as traffic is heavy and extra charges are easily accumulated along the way with the various travel restrictions. To my relief the bus driver’s eyes are peeled to the route in front, as the road is only wide enough to accommodate one bus at a time − the timetable for local buses is often several minutes late in both directions. 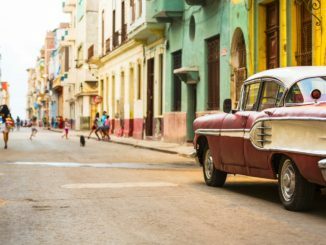 Delays are part of life along this hazardous route filled with villas, monasteries and picturesque villages, dotted with yachts and fishing boats in the turquoise water. As we pass Positano, I hear shirks from some of the other passengers. Anyone suffering from Acrophobia is at a disadvantage to truly enjoy this coastline. On arrival in Amalfi I’m free to wander but instead go with Ugo to explore the Basilica of the Crucifix and diocesan museum. The crypt holds the relics of the body of St Andrew and the story of his life is painted on the walls of the cathedral. 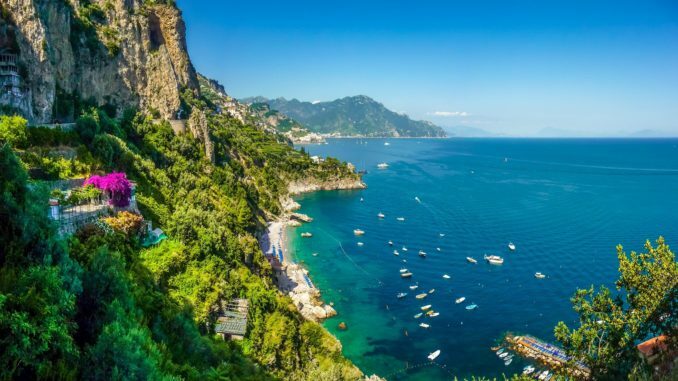 Amalfi was one of the four powerful maritime republics of the middle ages and home to the inventor of the first perfected nautical compass, Flavio Gioia in the 13th century. His statue is on display at the harbour where we take a boat tour of the Amalfi Coast. We finish in Ravello which is probably the jewel in the crown with another show stopping panoramic view and home to the Ruffolo villa and Gardens. 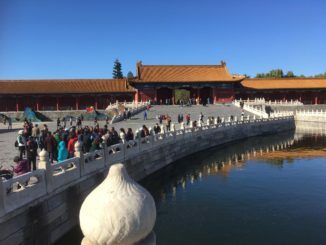 Being part of a group is a good compromise for the solo traveller or couples visiting an area with so much heritage and culture densely packed into a relatively small region. 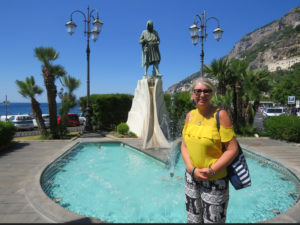 Having Ugo’s expert guiding skills at hand was a wonderful way to become acquainted with Sorrento and Amalfi allowing me to relax and savour the taste of La Dolce Vita.  Stroll through Capri town, visit the famous Augustus Gardens and admire the incredible views. Enjoy free time to enjoy a leisurely lunch, a swim in the sea or a visit to the famous Blue Grotto, before returning to your hotel.  Half-day guided tour of Sorrento Town followed by a guided visit to the excavations of the ancient Roman town of Pompeii.  Travel along the Amalfi Coast on a guided tour and enjoy its breath-taking scenery and pastel coloured villages, perched over the turquoise Mediterranean Sea.  Days in between will include leisure time to relax, swim, enjoy the food and the views.